Benefits of Global Blogging: Dinner Companions No Matter Where You Go! The Internet connection is very slow that I am on and typepad won't load. But, I manage to optimize some photos from my arrival and last night's dinner with the Clogger Team. So, if you want to follow me - best to click through the flickr stream. I was greeted at the airport by members of the clogger team, Virak and "Trajoke" and presented with a Cambodian Bloggers Summit t-shirt! I look pretty good for being a plane for over 24 hours. I remember at the 2005 Global Voices Summit, Rebecca MacKinon made a toast to everyone and jokingly said that those who are involved with Global Voices will never lack for dining companions no matter where they go in the world. So, later we met up at the Khmer Sirin restaurant for a delicious dinner of traditional khmer food. We dined outside on the porch. This is my first trip to Cambodia during rainy season, so I was really amused the huge downpour and thunderstorm (the porch was protected). But the rain made my colleagues nervous because they said it would make it hard to navigate in flooded streets with their motor bikes and they didn't have rain jackets. I got a kick out the fact that one of my colleague's mother called her cell phone because she was worried about her transport home. Mothers are the same all over the world! It was good to hear first hand stories of their challenges to maintaining a blog and their experiences training young people and others to blog. While nothing replaces face-to-face conversation, since we've know each other for over two years via our blogs - it felt like meeting up with old friends you hadn't seen in a long time. The Clogger team noted how they really want to see more local journalists or newspapers maintain a blog. Blogging is not widespread as they would like it to be. Colleagues who are IT majors do not have blogs and/or not familiar with them. Lux Mean had an idea of placing regular ads in the Khmer newspaper with summary of what was happening on the local blogosphere and urls. A bridge between paper and the blogosphere. They told me a story of how a journalist interested in writing a story about the summit told them they didn't understand what a blog was. They spent an entire afternoon explaining and showing blogs. The team was proud to say that after their mentoring, this journalist may be blogging. I also heard from the team about how difficult it is for them to maintain regular and consistent blogging. This is primarily because they do not have Internet access or computers at home and their blogs, while work related aren't necessarily part of their formal job. This is a similar challenge that ngo staffers may face in the US, but the difference is that a staff person the US is far more likely to own a personal laptop and enjoy an Internet connection (a high speed one) at home or a nearby coffee shop. Observes one clogger, "I have lots of ideas about what to blog when I get home, but I don't have the computer to write it. So I try to take to notes, but when I get into work and get access to the computer, I have to do work and the urge to blog disappears." I asked about the speed of Internet connection at the conference and I learned that a 512K connection is "really fast." My blogging friends were amazed that I have a 8MB connection at home which is a not in a urban area (I live outside the city). I'm finding the Internet connections very very slow. It is going to be a creative challenge to do extensive blogging. My friends confessed they were a little nervous with the conference and how many people are coming and how much good attention it has received. I confessed to being nervous about the video blogging session and how the upload speeds. I had planned to use the video camera kits I'm bringing over, DeeDeeDoll shared her Nikon smartfphone which had a nice video camera. These cell phones are popular. So, we will experiment now with using that to take some video clips and upload to jumpcut, blip.tv. or youtube from the SD card. I have to test to which ones easily uploads .gp files. I brought over some of the t-shirts and they got to pick out their shirts - a hard choice. My blogger friends were very excited and recognized the names of the companies and they were like rock star fans! 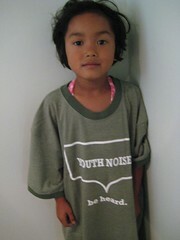 Lux Mean, whose organization sponsors youth programs, recognized the Youth Noise T-shirts! After dinner we organized the t-shirts into packages and Lux took them back to his office - we'll doing some bag stuffing a little later. Survived an 18 hour plane ride! Arrived in Singapore - found free Internet and Latte! The trip from LA to Singapore is like a triple red eye. But I managed to sleep and drink lots of water. Feeling okay now as I wandered around the Changi Airport in Singapore in search of latte to get of my cafeine withdrawl headache. I found it. I also found free Internet access stations. In a few hours, I'll be arriving in Phnom Penh where I will meet up with "Elephant" the Sharing Foundation's in-country staff person. I'll be visiting the projects in Phnom Penh and in Roteang Villeage. I am looking forward to meeting Leng Sopharath the young woman our family is sponsoring for college. The Singapore airport is modern, clean, sleek, and filled with interesting shops, restaurants, and orchids! I remember my first visit here and how different arriving in Cambodia is. Well, have time for more cafe. I was asked to participate on a panel proposal at SXSW 2008 with several nonprofit colleagues. The panel is about using Web2.0 for fundraising strategies. (And, of course, you can vote for it here) Before I left, I got word that one of the participants, Seth Mazow, would not be able to particpate. 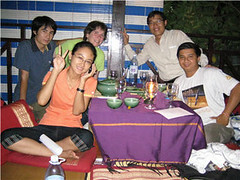 Through a strange twist of fate, I connected again with Kalabird one of the first ex-pat bloggers from Cambodia that I discovered in 2005 because of her amazing photographs in flickr. Michaela is now working as the Online Manager for a nonprofit focused on International Student programs, called World Learning and had attended SXSW where she felt that there needed to be more nonprofit panels. So, she graciously agreed to participate in our panel and do a quick interview for me so I could "pro blog it" for BlogHer. You are working in technology for a nonprofit, what did you did study in school? I studied at Penn State University, working towards a self-designed major in web and multimedia design (when it was just basic HTML and Macromedia Director). I had dreams of designing the websites for Disney and hoped to score a big corporate job after graduation. My second to last semester I did a study abroad on Semester at Sea, a floating university that travels literally around the world exposing students to 11 different countries, particularly developing countries. After life-altering experiences in Vietnam and India, and spending the night in a displaced persons camp in Turkey after the '99 earthquake, I knew my life couldn't continue on it's current course. But I knew nothing about international relations, development, political science, civil society,et al. I was just a tech girl with limited knowledge about the world. I also wasn't able to shift my major that late in the game. How did you end up in Cambodia? Once I graduated I took a job at a large consulting company in Washington, D.C. (doing website and multimedia design), with the long-term plan to get my masters in International Development and Technology at Georgetown University. I worked as a web developer and went to grad school part time, and I finally received my degree in Spring 2004. My long-term goal was to use technology to roll-out international development programs. I did a stint as a humanitarian analyst for the US government (where I spent more time advising them on new technologies than I ever thought I would) to see what it was like to leave the tech field altogether, and in 2005 I won a two-year fellowship supporting the NGO Pact in Cambodia on a women's microfinance program. What did you do while your in Cambodia (and Kenya)? Throughout my two years at Pact, with residence in both Cambodia and Kenya, I spent much of my time doing actual program work, providing technical assistance to our partners, and chronicling lessons learned. Over time, however, I realized that I missed the technology piece and what's more, the real value-added I could provide was through technology consulting. I recognized a huge need at Pact and several of the other organizations I met with, and when I returned to Washington, D.C. last January (after nearly 2 years abroad), I set about really learning the non-profit tech industry. I had the on-the-ground non-profit experience, high awareness of the bureaucracy, poor management, and ever lack of resources, and wanted to really tie in my years of work in technology. My fellowship ended this past May and I recently took a position as the Director of Online Strategy at World Learning - an international organization that does study abroad programs for high school, study abroad for college students, has a grad school in international development, and implements international development projects overseas. It seemed like the perfect opportunity to support all of the great programs (study abroad, graduate schools, and international development) that have helped me find my way to where I am now, and what's more, the organization is undergoing a huge transformation, so I get to be part of a complete rebranding/web redesign process that is set to be completed in February. It's been a great experience so far. It is a personal blog. It's funny, I stumbled into blogging when I worked for the government and wasn't challenged, and I had no access to FTP and wanted to keep working on my web skills. Blogging seemed like the easy answer and now it has evolved into what I do for a living. I will be starting a new blog focused on nonprofit technology issues that will serve as my professional development blog. I'm also an avid photographer too, my flickr stream houses all my images in case you are interested. Why do you think it is important to have a nonprofit focused panel at a Web2.0 conference like SXSW? I think having more non-profit panels is critical. There's no doubt that we can learn a lot from the for-profit sector, and apply that to non-profits, but it would be great to have panels that tackle many of the struggles we face in the non-profit world, like limited resources (particularly money and tech personnel), a different agenda, and different web goals. A lot of the non-profits I've spoken with feel that the web is too intimidating to try to tackle, and I'd like to change this perception and help them feel that web technology is accessible to everyone. I know this isn't going to happen overnight, but it's definitely something I'm committed to. I'm in Chicago in spirit. Just found the detailed post of links for the SLCC Nonprofit and Education tracks. It's here. Enjoy! My husband and kids dropped me off at Logan Airport a couple of hours before my flight to LA to connect to my flight to Phnom Penh via Singapore to attend the Cambodia Bloggers Summit. I flew American Airlines and the terminal was a zoo. I waited in line 2.5 hours and was little worried I'd miss my flight. 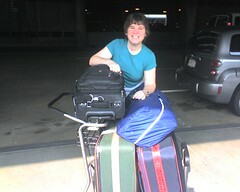 After a dash to the security checkpoint and I got to the gate for my flight to LA. They said, no you're going to St. Louis. The check-in desk gave me the wrong boarding pass. This is a little bit disturbing because the TSA guy checked my boarding pass and passport didn't notice! The flight was uneventful except I had a terrible seat - exit row by the front door and didn't have time to buy food. So, I drank a lot of water and arrived in LA early and starved. Ate lunch or maybe it is dinner ... it was comforting in a strange geeky way to read twitter updates on my phone. I didn't feel alone. I found wifi and plug. And now I'm waiting for the check-in desk for Singapore Airlines to open in a few hours. And, don't be alarmed if you see a few posts appear while I'm crossing the International Dateline ... I'm not blogging from the plane, although apparently a First Class seat on Singapore Airlines gets you Internet access. I've scheduled a few to publish while I'm traveling. That's an old blogging trick if your blogging platform offers that feature! That feature is really useful if you are going on vacation, don't have good Internet access, or help you through writer's block. Writer's block? Yeah, you know, when you don't have anything to say and you can't formulate a sentence if your life depended on it. I take advantage of creative highs. There are times when I’m running over with ideas. When this happens I try to write, write, write. During these times I can build up a surplus of good content to use when I need some time off. I've been bad about that, but it is really important to give yourself a chance to think and reflect. I wanted to make sure to I blogged this before I take off for Cambodia. Two upcoming workshops/conferences to put on your fall schedule. Expect a few more posts over the weekend pending Internet access while I'm waiting for my connection to Singapore from LA. She's Geeky - Kaliya Hamlin, the expert of unconfernces, is putting together this unconference for women who work in technology, both nonprofit and for-profit. I'm going to try to make it. Will you? John Kenyon is doing a series of Webinars for NTEN on technology leadership. (In fact, I'm joining him for the one on social media) Anyway,the first one is on September 12th and is about "Getting the Big Picture"
We know that information technology touches many aspects of our work in nonprofits. From accounting to programs to fundraising, we use technology to organize and analyze data, to communicate, and to deliver services. In this session, we’ll examine the role of information technology in supporting the essential functions, business processes, and mission of a nonprofit organization. Ranger Rick, the persona of the National Wildlife Federation, has been banished from Facebook! 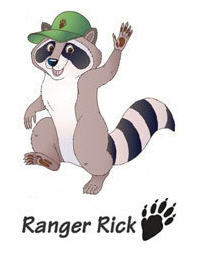 They need your help to bring back Ranger Rick's profile that was recently taken down by Facebook Staff. Help bring back Ranger Rick's profile Email: appeals-comment@facebook.com and ask them to let Ranger Rick exist on Facebook! Read more about it from Green Miles blog and a summary of reactions from other nonprofits here. Razoo promotes social good. They are hosting a contest to win $10,000K to celebrate their launch. Sixdegrees.org is running a contest with Hanes T-shirts to win $10,000K. The Knight Foundation is sponsoring The Knight News Challenge and they've got $5 million to give away. Make sure to read through the FAQ and look at last year's winners to get a sense of what they are willing to fund. The MacArthur Foundation's Digital Media and Learning Competition includes a "Knowledge-networking" category designed to take good ideas and circulates them widely, taking full advantage of the Web's potential for collaborative thinking. If your nonprofit is based in the DC area, NpowerDC reminds us that the deadline for their annual Technology Innovation Award is two weeks away. The winners get $65,000 in-kind contributions of consulting, hardware, and software. Tactical Philanthropy Blog notes that the next Giving Carnival will focus on Fundraising for Nonprofits and will be hosted by Gayle Roberts. Also, be sure to read Sean's summary of a recent article in the Wall Street Journal about how a new generation is reinventing fundraising. Sean's take, "Innovations in online philanthropy is often attributed to “young people”, but I think it is probably more useful to think of the “young people” as early adopters rather than the phenomenon being linked to youth." I agree. Do you? The AFP blog points to a press release from Firstgiving about the launch of a social networking site. Marnie Webb notes "What do you think of the survey O'Reilly points to? How will these trends impact nptech? Ruby Sinreich suggests that everyone should read this article about nonprofits and Web 2.0. Here's a nice collection of links from the NTEN blog with good footnotes that includes a pointer to the ChicagoTechnology Cooperative, a group comprised of consultants, technicians, developers, and designers, with extensive experience serving the unique needs of nonprofit and community-based organizations. I know there is a similar cooperative in the Bay Area called Tech Underground. Are there others? "New Realisties in Online Advocacy" tagged and Jason from Democracy in Action observes, "Thus you need a strategy that combines email lists pushing your message, vision, and resources out into communities residing on sites and networks other than your own." Ruby Sinreich facilitated a session at BarCampRDU on how geeks can use their powers for the forces of good and has a wiki with resources. The Case Foundation blog also has a section called "Tech4Good"
TechSoup blog posts about an online tool and forum discussion about green policies. I rounded up some other resources here and the Shaping Youth Blog did a roundup post with huge pile of green geek, recyclying, and youth education links. Sounds like Gavin of Gavin's Digital Diner had a great time sipping Burgundy wines in France, but even better wrote a detailed description of his damn DAM system. According to the NTEN Blog, Blackbaud, a provider of services designed for nonprofits, has launched Blackbaud Labs, a sandbox for projects in the pipeline. Peter Gulka had plenty to say about the lab. Rayt allows users to rate the content of web sites by making a comment and also to rate other people's comments. 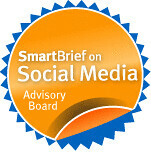 Found via this post tagged nptech by Meghan. Bubble.us is a free web application that lets you brainstorm online. Google Earth launches Virtual Telescope: Sky as noted by the Viralroots blog where you can see both GoogleEarth and the sky. Vicky Davis, CoolCatTeacher Blog, writes about how it might be used in a classroom. Wanna check out more tech tools? See 1,010 Favorite Tools on the TechSoup Blog. What's Hiafux? It's a list of Israeli Linux Clubs! And if you're looking for some fabulous manuals for open source software, check out the Floss Manuals. GINKs is a knowledge network promoting the use of ICTs in development in Ghana. Kabissa.org wants to know how you are using "Web 2.0" to pursue your grassroots agenda in Africa. If your organization is based in the UK, the ICT Hub Unmet Needs Fund is now open for applications. They are seeking to fund innovative ideas that support ICT needs of voluntary and community organisations. Check the web site for the application and more details. 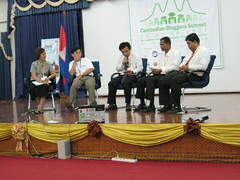 The Cambodia Bloggers Summit and the Boliva Blogosphere will have their first ever bloggers conferences on Blog Day! Is your nonprofit planning to participate on Blog Day? Wikiscan let's you see who is editing wikipedia as mentioned in a recent Wired Magazine article. But there isn't much about the demographics of who is using wikis, particularly their age. Some say it is impossible and a poll by wikimedians here. Good summary of videos and nonprofits found on the mobile voter blog. Lots of pointers to resources like Expert Voter which is similar to what you now see on YouChoose, it organizes the candidate youtube videos by issue. All the candidates. The Second Life Community Convention is taking place this weekend in Chicago. There's a nonprofit track. Some more about Social Networking from the inside and outside of organizations and Free Ranger Rick. Akkam's Razor is a play on the spelling of Occam's Razor concept (simplicity) because those domains were taken (and of course the other Occam's Razor Blog is from Avinash Kaushik). Someone tagged this post of links with NpTech which lead me to the ColourLovers blog. Viralroots covers viral media, viral politics, and includes a viral video fo the week. The $5 philanthropist is not a new blog, but well worth reading. I appreciated the post about an unplugged vacation! Mobile Voter Blog is the blog for organization Mobile Voter and they are currently working a book with Rock the Book entitled "Mobilizing Generation2.0: Using Web2.0 Technologies to Recruit, Engage, and Activate Youth." David Saski from Global Voices and who is running the Rising Voices project will also be at the Cambodia Bloggers Summit in Phnom Penh next week. He's over in Thailand now, but was glad to see he had Internet access - looks like free wifi too. I found out that thanks to Adam Hyde of FlossManuals.net, he will be distributing free printed guides to open-source software and he will also be giving out digital cameras to up-and-coming Cambodian photobloggers. FLOSS Manuals provides quality free manuals about free software. There are a lot of people that know a lot about software. There are also a lot of people that need to know about software. FLOSS Manuals aims to connect the two by making writing and reading about software easy. You'll find links to an array of manuals for often used open source programs like Audacity (there was even a link to a print version you can purchase via LuLu if you like paper and I do). The manuals are organized by "read," "write," and "remix" which I just love. I also found a manual for Kino, a video editing program that runs on Linux. It reminded of the ngo in a box collection of open source video editing tools that I read about on the NTEN blog. Does anyone here use Linux to edit video? (and speak spanish?) http://estudiolivre.org/lives. At havemoneywillvlog.com, we are considering giving support to this software project to provide free video editing software to videobloggers in other countries. The developer livers in Brazil. M concern is that not enough people use linux...and edit video with it. Philosophically I support open source and free software, but I wonder if there is a userbase. The only person I recall doing video work on Open Source is James Davis who did this screencast with Ubuntu and wrote a post about it. I saw a post about nonprofits and video use here, but not much mention of open source tools. Anyone else out there using Open Source video editing tools? I've been busy trying to cram over 150 tech shirts into a suitcase to take to Cambodia so I missed this one. So a hat tip to Katrin Verclas and Progressive Exchange listserv. Facebook has been taking down organizational profiles for nonprofits, including Ranger Rick's profile. Your childhood hero, Ranger Rick, has been banished from Facebook. We need your help to bring back Ranger Rick's profile that was recently taken down by Facebook Staff. Ranger Rick Raccoon, the persona of the National Wildlife Federation and logical representative for the voice to inspire Americans to protect wildlife for our children's future has been silenced. We need your help to bring back Ranger Rick's profile that was recently taken down by Facebook Staff. Email: appeals-comment@facebook.com and ask them to let Ranger Rick exist on Facebook! We had this same situation happen a couple weeks ago. 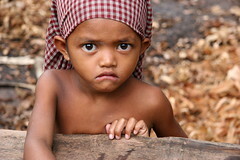 When we first ventured onto Facebook, I created an Oxfam America profile. This profile has existed for about a year. Two weeks ago, it mysteriously was shut down. I emailed Facebook as I assume someone hacked our account. I received an email back stating that only individuals are allowed to create profiles, but that we were more than welcome to start a group (which we already have). They said "under no circumstances" would they change their policy. So now my personal Facebook profile is the Administrator of the Oxfam America group (which I can tell you, is less than ideal). I know the move by most orgs recently has been to transition over to Facebook (something Oxfam has slowly been doing), but this is very annoying. I know they take privacy very important at Facebook, but I don't understand the logic behind this one. They make it a lot harder to interact with people than MySpace does. We will continue using both MySpace and Facebook, but this is a frustrating development. Ivan Boothe from Genocide Intervention Network points out that Facebook's policy is because it wants to be user-centric versus group centric. It's the same reason they don't allow messaging to group members after your group surpasses 1,000 (except for the paid political campaigns) -- because their analysis is that this would be troublesome for users, i.e. lead to a lot of spamming by the big groups. That does make it harder to organize large campaigns on Facebook, but I certainly understand their reasoning. My guess is Facebook organizing will start moving in the direction of a Facebook App for each organization, as the Obama campaign did, as Apps allow for much more specific privacy settings and, thus, opting- in from users who are willing to receive your updates/messages/pokes/whatever. Eric Eckle suggests that this points to some larger organizational issues in embracing social networking sites. Regardless of what Facebook and MySpace do and don't allow, their members want to interact and converse with authentic, real, responsive individuals, not institutions. After all, if somebody wants to read organizational boilerplate, they'll visit your homepage. Institutional spokespeople who cultivate a useful reputation within a community like Facebook or Digg while acting on behalf of their employer are building a very personal equity. They can't just hand it over to their replacement when they move on to greener pastures, even if they wanted to. In the first of a series co-sponsored by NTEN and Salesforce.com Foundation, I covered the integration of Google Adwords with salesforce.com. I'm pleased to announce that the second screencast is now available. It delves deeper into the uses of salesforce.com campaigns tab, "Salesforce Campaigns for Nonprofits". There some kind words over at the NTEN Blog about my most recent screencast. Now comes the reflection on the process, the craft of screencasting. I didn't know the software like the back of my hand. And, to make it more daunting, I'm hardly a database expert. If you're making a screencast, and you end up having a vertical monopoly on the process (you write the script, do the filming, operate the mouse, do the editing, and produce it), you need to become a super learner. As Stephen Downes notes, being a super learner takes time and practice. So, I've been asking myself is there a way to make this process more efficient? For this screencast, I conducted several interviews lasting approximately 50 minutes. So that left me with a few hours of video and audio to edit and that's too much to do in Camtasia. And, I don't have the patience to listen to the entire recording over again. I recently read a blog entry by Jon Udell about his editing process for a screencast that uses this interview technique. Because the screencast is conversational, the screen doesn't have to exactly synch the audio. He also notes that he doesn't log with markers, but edits as he is listening to the interview. I used a hybrid of his approach. So, here's how I attempted to do this screencast in a documentary style a bit more efficiently. I started my research on a listserv of practitioners for SalesForce Nonprofit version asking for case studies and examples. I got enough information to put together an outline and rough storyboard So, I had the overall structure for the 15 minute screencast. I also got an good idea of who to interview in more depth and some ideas for examples/case studies. I interviewed four people on Ready/Talk using the recording feature giving them the ability to share their desktop. For one of the interviews, when they showed or mentioned something I wanted to incorporate into the screencast, I asked them to show it again while I recorded it locally on my desktop using Camtasia. I asked them to be quiet for a minute (this left a marker in the file - no sound and quicker for me to find during editing). I noted the start time and end time. Immediately after the interview, I edited the mp3 file to grab the sections that I needed to match the visuals. I was careful to name the audio and screencapture files the same so I could easily match them up in Camtasia. This became the case study in Act 3. For the detailed editing, I grabbed succint descriptions from the interviewee and took out ums and repititions (mine too!). I had to record some voice over narration and intros into each the different sub-sections to make it flow. I also had to edit down the screencapture to match the audio length. I imagine this type of editing is similar to putting together a TV news story which makes me think there must be a blog or book about that those editing techniques that might be useful to me at some point. Two of the other three interviews were more of a free wheeling discussion and I did not do any local screencapture. However, while I was interviewing, I noted the "tacit knowledge" bits - the tips and jotted down the approximate start and end time of the tip quotes I wanted to use. I grabbed these from the mp3 file from Ready/Talk recordings. I discovered that I could playback the Ready/Talk video file, and screencapture particular sections as either stills or video using Camtasia. Then I pulled together the visuals and audio and organized them by tips and wove them together. I filled in with voiceovers when needed. While I was in the final phase of editing, I realized that I really needed a quote from a particular person. So, I arranged for an interview over Ready/Talk and asked a specific question and did a screencapture locally on Camtasia while Ready/Talk captured the audio. I found that it was far more efficient to edit the audio quotes in audacity rather than pulling in to Camtasia and edit them while working the movie. I also found it more efficient to render together each audio/screencapture into an avi file and then pull into Camtasia as one file. Makes it easier because once the file gets too big in Camtasia it starts to crash and you loose you work. That was happening to me quite a bit in previous screencasts. Also, the detailed audio editing that I was doing - like pulling out ums and splicing together sentences - Camtasia editor isn't the best tool. Once you go in for close editing, it crashes. So, the big learning for me here was to do any fine tune editing outside of Camtasia and use Camtasia to pull in the chunks and add the titles. One my failures was an attempt to get the interviewees to use Jing to answer my interview questions. Then, attempt to screencapture the jing recording or transform the .swf file into .wmv or .avi and pull into Camtasia. It didn't work for both technical and human reasons. Note to self: I need to ask David Tames for some tips or sources on this type of editing process - documentary/news style. It is getting faster as my skills improve, but I want to learn more about particular techniques to improve the end-product and efficiency. 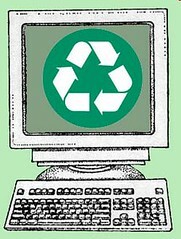 There's a follow up discussion on the TechSoup discussion forums about nonprofits and green computing policies. It's here. I've never been to South by Southwest Interactive Festival or SXSW. Only read about it online wishing I could attend. I wasn't as lucky as Amy Gahran who won the free pass to attend at BlogHer. Non profit groups struggle with funding and public support issues on a daily basis. Yet many have overcome the odds and made a splash online and offline by using the latest Web technologies -- for pennies on the dollar. This discussion will center around the stories, strategies, triumphs and challenges of innovative non profits with a passion for change and the cajoles to rock it out online. I found this slideshow Via Stephen Downes. First off, if you are a slideshow fan, you will no doubt recongize this style of storying telling. The technique is to illustrate the issue through the experience of an individual. I've seen this style be copied by several users on SlideShare to explain enterprise2.0 issues. Here's another one called "Meet Charlie." I used the technique two years ago for a presentation at the first netsquared conference called "I Tag the Hand that Feeds Me" or what I should retitle "Meet Sally." Is this the generational divide that play out in workplaces over the next 15-20 years? That's tongue in check coming from a babyboomer who has gen y media habits. "The type of things we post regularly on Digg and Netscape and Newsvine are real-world events, announcements, and discoveries – so our online efforts dovetail with what we’re doing offline. We’re becoming popular on Digg and a number of the other big social news networks regularly because of the strength of our content. We’ve brought huge amounts of new visitors to our site through these tools and have worked hard to develop engaging communities on them at the same time." My question is, are the organizations doing this, like TNC, using personal usernames or organization usernames? So far, I've been getting involved with online communities like Facebook by creating a personal profile about myself, and then creating a group for my organization. Am I going about this the wrong way? Should I be creating a personal profile for the organization? the other hand, are designed for people to come together around areas of common interest, so you could set up a group about your org. Facebook is deleting organizational profiles now. Amnesty's was disabled just recently and other organizations have reported the same, enforcing facebook's rule that only individuals can create profiles. Nonprofits can create groups and causes (we have both for NTEN) but of course, as was pointed out, neither can take advantage of the applications and added functionality at this point. Something to lobby Facebook for, and we at NTEN are in touch with them about this already. Blog Day and One Web Day: Are You Participating? 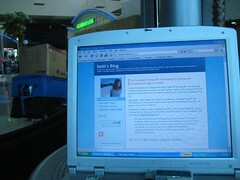 August 31, 2007 is the third annual Blog Day. BlogDay is focused on getting to know other bloggers from other countries and areas of interest. On that day, you write a post recommending 5 blogs to read. You are suppose to notify the bloggers, write a brief description of their blogs, and tag your post with BlogDay2007. It's simple to do and a great way to connect with other bloggers and pass along some link love. After I get back in September, OneWebDay is next community web event on my calendar scheduled for September 22, 2007. OneWebDay is a celebration of the Web and what it means to us as individuals, organizations, and communities. Check out this mini-documentary at dotsub for more about the event. 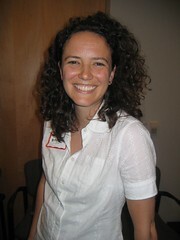 Susan Crawford is the founder of OneWebDay. She’s a law professor in New York City, a member of the ICANN board, and a fellow of the Center for Democracy & Technology, and the Yale Information Society Project. She teaches communications law and cyberlaw, and writes frequently about these subjects on her blog and in published articles. In researching the origins of OneWebDay, I learned that BlogHer Mary Hodder was involved in some of the initial evangelism for the day. In thinking about how to use OWD for your own purposes, it seems to me (personally) that you should keep in mind that these obstructions are different in different parts of the world. For some people, just getting access is an obstacle. For others, it’s highspeed access. For others, it’s symmetric access (uploading and downloading). Censorship/gatekeepers of all kinds are concerns, particularly at the infrastructure layer, all over the world. Nonprofits can help make the web “just a little better than it was before” simply by taking part: it’s up to you to decide how. The event is on the NpTech Group Upcoming Calendar (the tag for the nonprofit technology field), so I suspect there will be some creative ideas that nonprofit techies will contribute to the event. Building Online Communities with Drupal and Dave Briggs has a new blog! David Briggs has a new job and as a result as a new blog called FEconnect. FEconnect is a blog about using social media and web 2.0 technology in building communities in the further education sector. It’s also a platform for building online social tools to provide practical benefit as well as demonstrating the power of the web as a platform for community engagement. His post, "Building Online Communities With Drupal" is an excellent primer for non-geeks. I just discovered that the screencasts that I've seen over at Masternewmedia are done by Michael Pick. And, I just found his portfolio and really enjoying it! Happy Birthday Britt and Abenamer! It is Britt Bravo's birthday -- go wish her happy birthday! Also, Allan Benamer or as we know him "Abenamer" from the nonprofit tech blog.